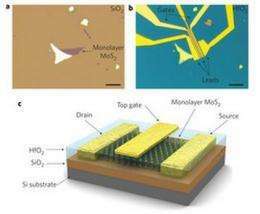 (PhysOrg.com) -- Because of its physical limitations, silicon use in tiny integrated logic circuits will have to one day soon be replaced by something that can work in a smaller state. That is, if we want to see miniaturization of computer components to continue. For several years, graphene has been seen as the most likely heir to the throne because it’s only one atom thick, which seems to be the physical limit for non-quamtum based computers. The problem with graphene though, is that it’s not a semiconductor in its natural state; it has to be put through special processes to make it so. Molybdenite (MoS2), on the other hand is a true semiconductor and it, like graphene can be produced in atom thick sizes, perhaps making it the ideal material to replace silicon once it reaches its size limits. Andras Kis and his colleagues at the Swiss Federal Institute of Technology in Lausanne, seem to believe so, their research into a way to create an actual integrated logic circuit from this material has been published in Nature Nanotechnology. Molybdenite is a mineral that is found in nature but can also be made in the lab. Like silicon it can sometimes conduct electricity and sometimes not depending on the level of voltage (the bandgap). The problem with using molybdenite to create atom thick integrated logic circuits though, has been in figuring out how to connect a metal to them to convey the electricity. This is where the Swiss team has made a breakthrough, they’ve found they can attach an incredibly small bit of gold electrode to the molybdenite using hafnium oxide when it’s sitting on top of a base of silicon. The result is an integrated logic circuit that is thinner (just 0.65nm) than one that can be made from silicon. And, it’s much cheaper to produce than one of comparable size made of graphene. Kis and his team don’t expect the computer industry to drop silicon and take up with molybdenite any time soon though, or maybe even at all. There’s still too much to learn about the material, they write and it’s also possible that other materials such as carbon nanotubes could be a better solution in the long run. But regardless, the fact that molybdenite has been shown to be a viable alternative for silicon is likely to take a little of the pressure off of chip makers as the limits of silicon eventually force manufactures to turn to something else. Two-dimensional materials are attractive for use in next-generation nanoelectronic devices because, compared to one-dimensional materials, it is relatively easy to fabricate complex structures from them. The most widely studied two-dimensional material is graphene, both because of its rich physics and its high mobility. However, pristine graphene does not have a bandgap, a property that is essential for many applications, including transistors. Engineering a graphene bandgap increases fabrication complexity and either reduces mobilities to the level of strained silicon films or requires high voltages. Although single layers of MoS2 have a large intrinsic bandgap of 1.8 eV (ref. 16), previously reported mobilities in the 0.53 cm2 V−1 s−1 range are too low for practical devices. Here, we use a halfnium oxide gate dielectric to demonstrate a room-temperature single-layer MoS2 mobility of at least 200 cm2 V−1 s−1, similar to that of graphene nanoribbons, and demonstrate transistors with room-temperature current on/off ratios of 1 × 108 and ultralow standby power dissipation. Because monolayer MoS2 has a direct bandgap16, 18, it can be used to construct interband tunnel FETs, which offer lower power consumption than classical transistors. Monolayer MoS2 could also complement graphene in applications that require thin transparent semiconductors, such as optoelectronics and energy harvesting.